Was wandering the streets the other day and came across this beautiful scene. What struck me first with this woman would have to be her independence. 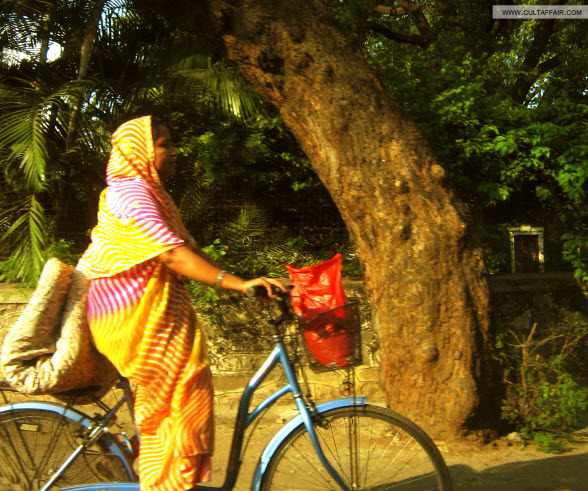 The ease with which she manages the rug at the back of her cycle and the bag in the front, not to forget the sari she is wearing is not the easiest outfit for cycling. She is my power woman. Drop in your comments and feedback about this photograph below. Omg this is soo cool 🙂 Power women indeed, she manages everything! nice click!